There are several Saints & Blesseds in the Papal Artifacts’ Collection whose bodies, when exhumed, have been found to be incorrupt. They include St. Jean Vianney, St. John Bosco, Blessed Pius IX, St. Pius X and St. John XXIII. Below the commentary, links to their stories on Papal Artifacts have been included. Be sure to click on their photos to view the information connected to them. We asked them to intercede for us. Incorrupt Saints: What Do They Mean? Part of the regular process for canonization is exhuming the body of the possible saint. There are three reasons for this: simple identification, to extract relics for distribution to the church and finally to move the saint’s body to a chapel or church which will be a more appropriate place for prayer and devotion. In exhuming these holy men and women there have been multiple discoveries of incorruption — saints who have little to no sign of decomposition. The Catholic Church hesitates to officially refer to incorruption as a miracle, though there seem to be some aspects of the phenomenon that are hard to explain. For various reasons, many of these people were in fact buried in conditions that were conducive to decay, and in some instances lime was placed in the caskets to expedite decomposition. This was often done so that there would be a quick turnaround and the grave could be used again, often because of lack of space in European cemeteries. In spite of such circumstances, many of these saints have been found to be completely incorrupt many years after their deaths. We may never know the reason for this unusual occurrence or why certain saints are incorrupt while others are not. The fact that this happens to some saints’ bodies does not mean they are any more holy than the ones who did decompose. For example, St. Therese of Lisieux, the Little Flower, was completely decomposed except for her bones, and no one could justly say that she was not a holy woman. 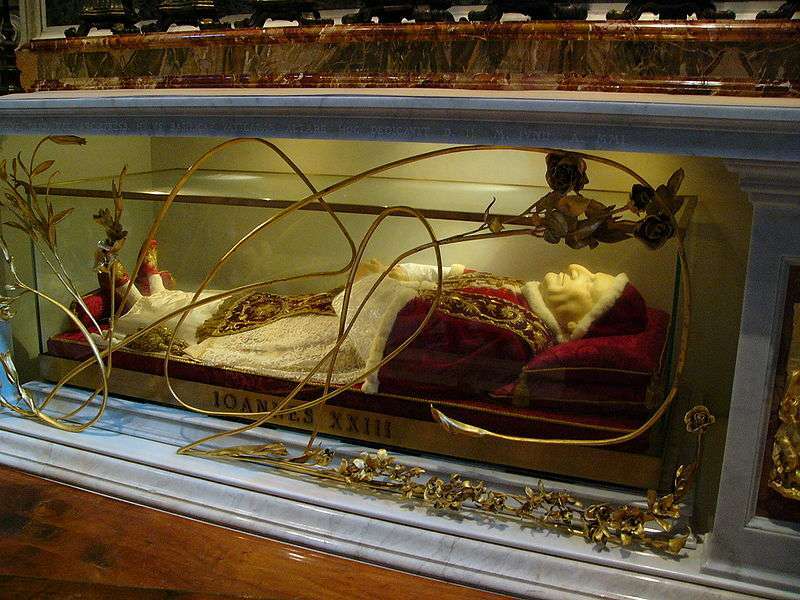 Unfortunately, these “incorrupt“ saints often become nothing more than a curiosity to the people who see them. Travel to any major European city, and you can bet that there is a church that has the body of one of these saints on display. In fact, they are not so much on display as their tombs are usually altars. Most often the saints have wax or silver masks over their face and hands. This is not to arrest the decomposition but to prevent discoloration of their skin in the exposed light. I have had opportunities to see many of these saints, and some of them are quite incredible. The one that comes most to mind is St. Catherine Laboure, the visionary of the Miraculous Medal. Her body is in a side altar in the motherhouse chapel of Our Lady of the Sun in Paris. St. Catherine died in 1876; she is the only incorrupt saint I know of whose eyes are still open! With a simple Google search you can find many images of such saints; such occurrences certainly are one of the more curious components of the Catholic faith. Incorruptibility is different than a good embalming job or mummification. It is truly an illustration of the inexplicable. But the really big question is why does this happen? What (if anything at all) is God trying to tell us? Again, there is no official explanation of the hows and whys of this phenomenon, but I have heard one good explanation. The saints are the Gospels lived. They are the ones who most successfully live out the Christian ideal. The goal of every person is to achieve salvation, to one day be with God in heaven. When a person is declared a saint in the Catholic Church, it is simply a statement that we can have certitude that this individual is in heaven.